External Reports in Metric Insights fetch images from source Reports of the supported BI services.Typically, in order to create an External Report, a URL to the source Report is required. It can be set manually or be generated automatically from a template. Admin > Data Sources. When a new Plugin Connection profile is created, the system requests certain required Parameters. They are required because they usually point to the location of some information in the source service. One of the typical required parameters is a server or endpoint. The given example is for Tableau. 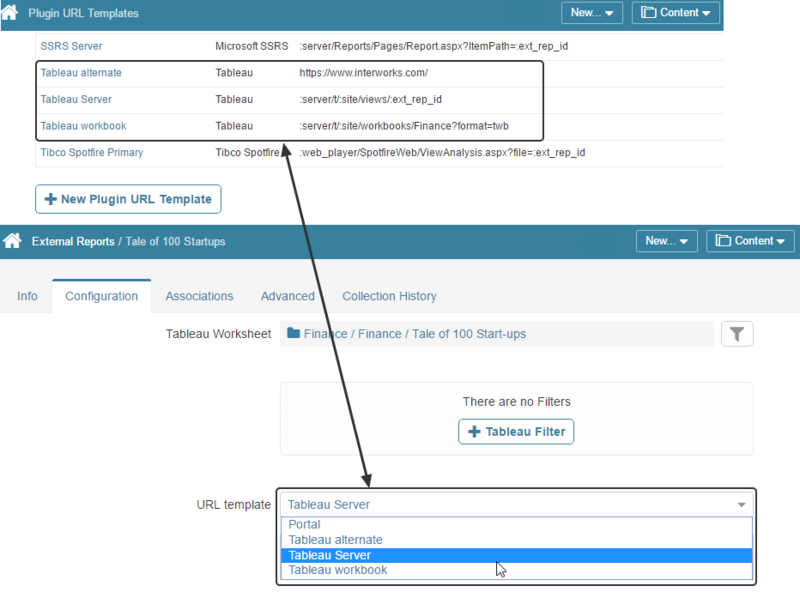 Required parameters for Tableau include Tableau server and Site ID. Admin > Advanced > External Report Types. External reports are fetched via the link to the source service. This link can be added manually or generated automatically. To enable automatic generation, go to Admin > Advanced > External Report Types > choose the corresponding report type or create one > set the Auto generate URL field to 'yes'. Admin > Advanced > Plugin URLs. If the URL is generated automatically, it requires a template to indicate what variables should be included into the URL. Template typically includes variables related to the location of the data in the source system and the ID of the object to be fetched. 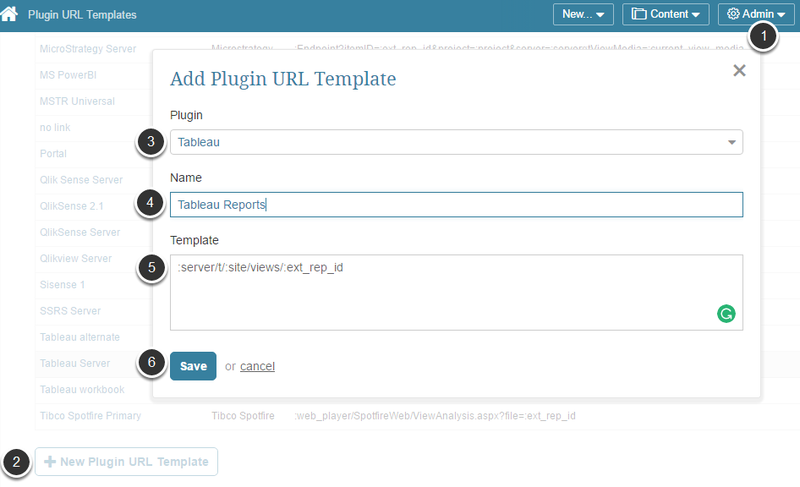 When a new External Report is created (at New > External Report > Report Type), the Plugin Connection Profile (source) and External Report ID (in the given example - Tableau Worksheet) should be selected to guide the system on what object should be fetched and where it can be found. 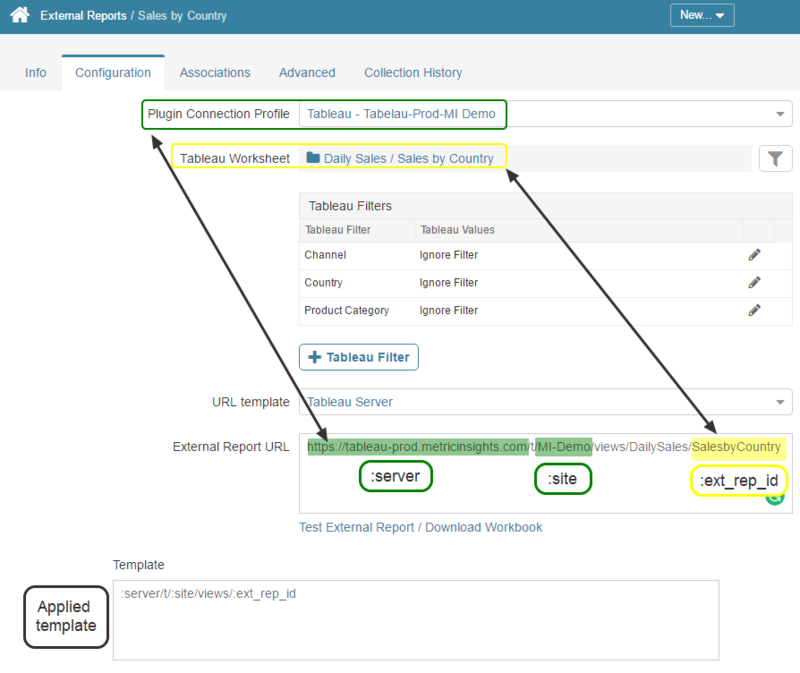 The selection in the Plugin Connection Profile and Tableau Worksheet fields provides substitutions for corresponding variables. This is how the URL is automatically generated for the External Report. Access Admin > Advanced > Plugin URLs. The list of Plugin URL templates previously created in the system opens. At the bottom of the screen click [+ New Plugin URL Template]. 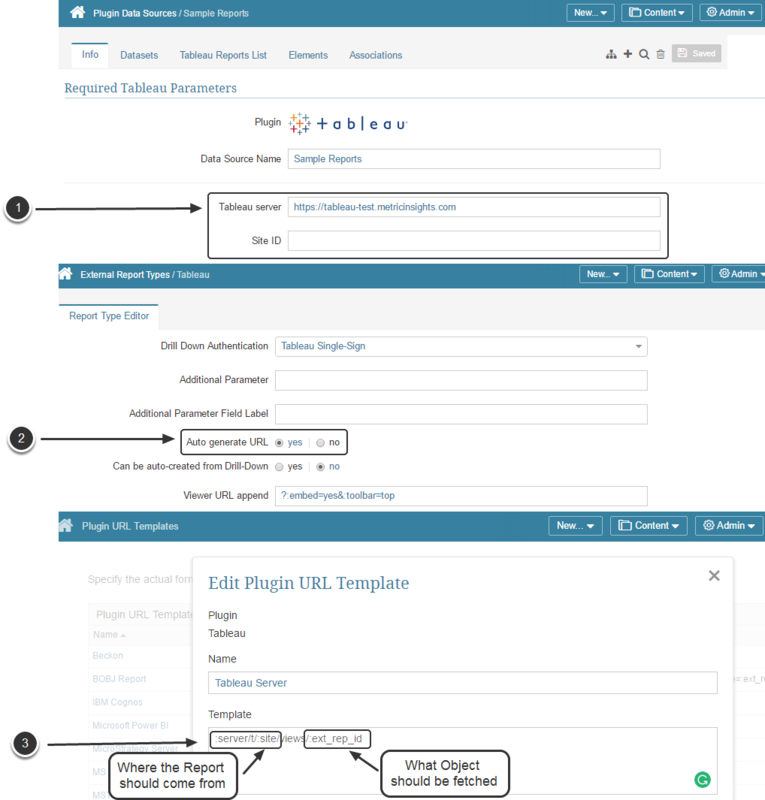 Choose the Plugin for which this template is created from the drop-down list. Name the template in the descriptive way. If there are multiple templates for one plugin, their purpose should be stated in their names. If more than one URL template is created for a specific Plugin, a URL template field is displayed in the External Report Editor for this Report Type. The actual variable names that can be used are dependent on the plugin data source. See the table with available variables for supported plugins. However, you can also use :ext_report_name, and :ext_report_id that get replaced with corresponding values in the Reports List for the given external report.